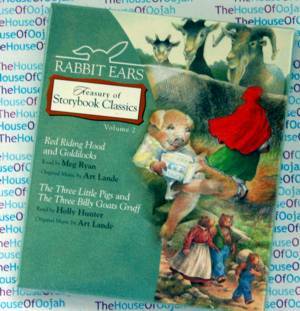 Rabbit Ears Treasury of Storybook Classics Volume 2 features timeless and clever characters—read by your favorite stars and featuring original music by some of today's greatest artists. The classic story of Red Riding Hood and the much-beloved tale of Goldilocks are among the most cherished stories in children's literature. These modern versions will captivate audiences as they have for generations, while reminding everyone that a little caution goes a long way. In the first of these two popular nursery tales, The Three Little Pigs, the wisest pig gets even with the big bad wolf, demonstrating that hard work has its own rewards. Next, in The Three Billy Goats Gruff, the greedy troll who lives under the bridge is no match for the biggest of the goats.